Gwynn Valley provides a nurturing environment and age appropriate program for younger children. Our Main Camp is for campers who have completed Kindergarten through 6th grade. 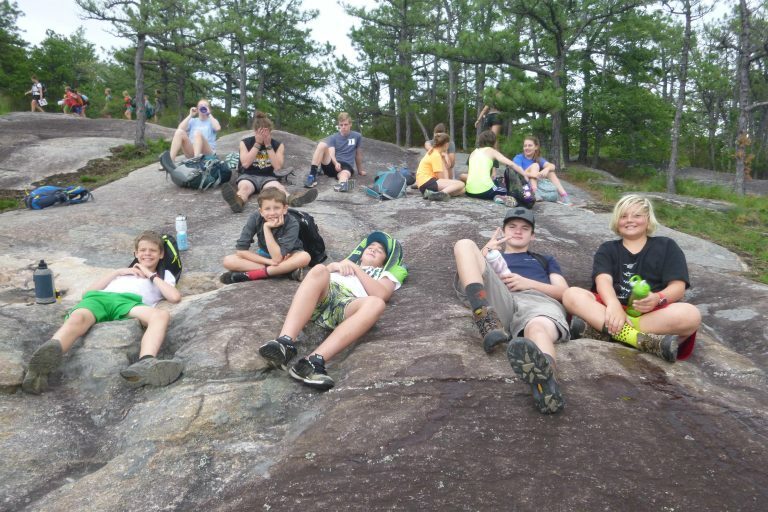 As our campers grow to preteens and teenagers, we offer three programs for older campers, Mountainside, Riverside, and our Young Leaders Program. We also offer a Day Camp Program for those campers who would like a taste of camp. Main Camp is for children who have completed K- 6th grade and is divided into two areas. Main Camp is the core of our camp culture, is our largest program with 160 campers, and is for campers finishing Kindergarten – 6th grade. Life at camp starts in the cabin where campers build strong friendships that may last a lifetime and works outward into program. 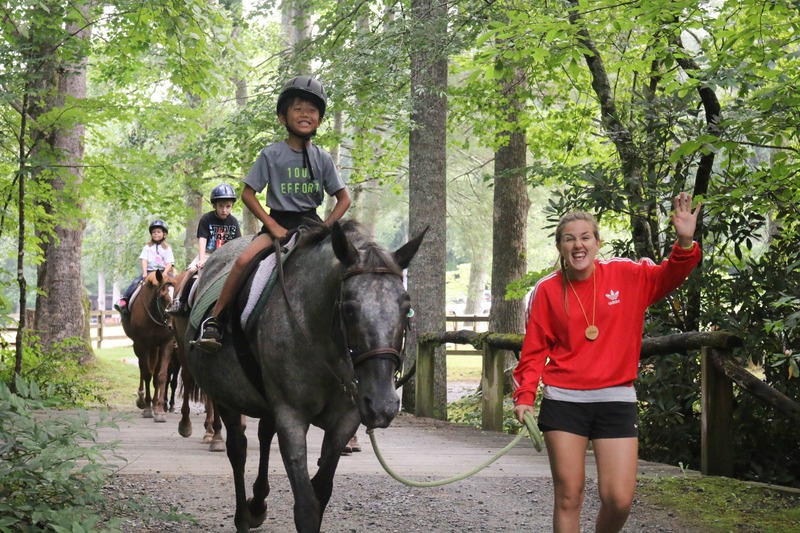 There are many different activities for our campers to choose from such as the Farm, the Mill, Climbing, Arts and Crafts, Blacksmithing, horseback riding, etc. Campers choose their activities and will have the opportunity to be exposed to many new program areas and skills. Main Camp offers a variety of session lengths including 1 week, 10 day, 2 week and 3 week sessions. The 1 week sessions are designed to provide a “taste” of camp for those children who may not have had a previous overnight camp experience. There are two cabin areas of Main Camp known as Hillside and Brookside. Campers in both areas enjoy all the same programmatic elements of Main Camp, with a slight difference in the cabins to account for the needs of younger and older camper groups. Younger campers live on Hillside, and older campers live on Brookside; the exact age divide varies depending on the median age of the session. On Hillside, the youngest area of camp, there are 8 campers and 2 counselors in each cabin. Many of the Hillside cabins also have either a Staff-in Training who is 17 years old or an Intern who has just completed high school to help in the cabin. Hillside usually is comprised of K-4th graders and in a shorter session, K-3rd graders. These cabins have electricity and a bathroom with a toilet and sinks; the community shower house is a short distance away. Children are placed in cabins according to their completed school grade, age, and years at camp. 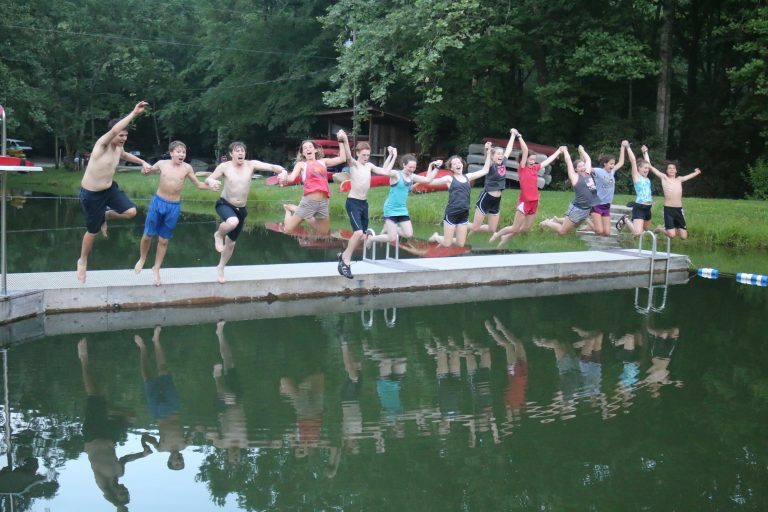 Brookside cabin groups consist of 8-10 campers plus 2 counselors. Some of these cabins also have either a Staff-in Training who is 17 years old or an Intern who has just completed high school to help in the cabin. Our Brookside is usually for 4th-6th graders although during a shorter session, we have 3rd graders living on the Brook. The bathrooms and shower house are close by. Children are placed in cabins according to their completed school grade, age, and years at camp. *If you would like to add your camper to a wait list, please complete the online application and submit the deposit. If a space becomes available, we will communicate with your family before enrolling your child. Your deposit is fully refundable at any time while your child is on the wait list. * All clothing and personal items must be labeled. A co-ed program for campers finishing 6th, 7th, & 8th grades. After finishing 6th, 7th, or 8th grade, Mountainside is a good option for many young people to continue their Gwynn Valley experience, or to attend Gwynn Valley for the first time. 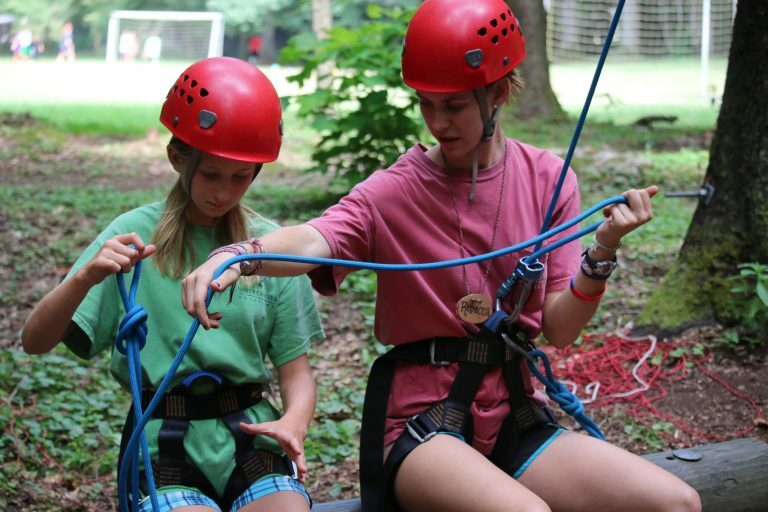 Mountainside has two 10-day sessions and two 3-week sessions and gives young people the opportunity to become an essential part of a small community of 50 campers. In Mountainside, campers are asked to take on more responsibility for themselves and the community. With this responsibility however, comes more freedom, spontaneity, and involvement in the program. 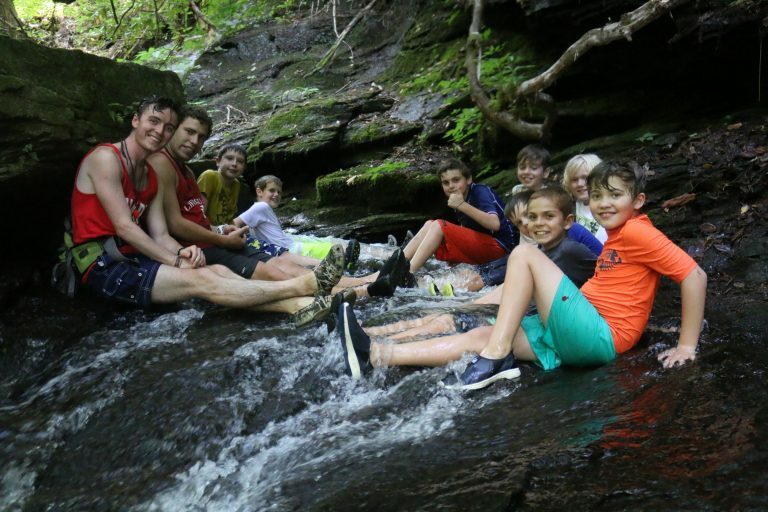 During the three week session of Mountainside, campers participate in daily activities in addition to a 4 day wilderness adventure during the last week of the session. Throughout the session, activities are centered on positive peer interaction, community building, learning skills, and preparing for the adventures. 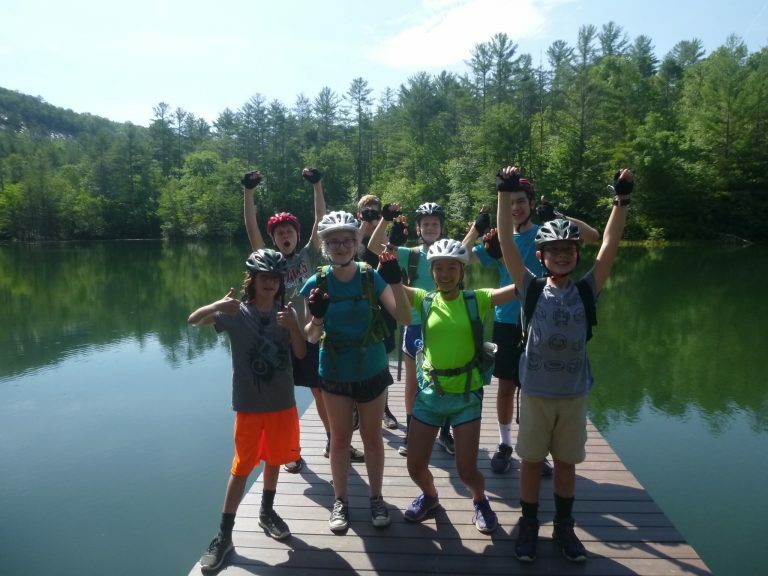 Activities leading up to the adventures encompass rock/wall climbing, hiking, orienteering, earth skills, pioneer skills, mountain biking, lake and river canoeing, teamwork and initiatives, service projects, and the ropes course. Many of the activities during the Mountainside program are similar to our Main Camp program. These might include arts and crafts, waterfront, creek hiking, tubing, group games, campouts, a visit to the Farm, sports, international days, and many others. Adventures In the first week, all campers will spend five separate days on “mini adventures” which gives them the opportunity to try each of the adventures offered. The second week, campers choose an adventure and then spend two days learning and practicing the skills needed to participate in it. During the third week, campers head out for their 4 day adventure. 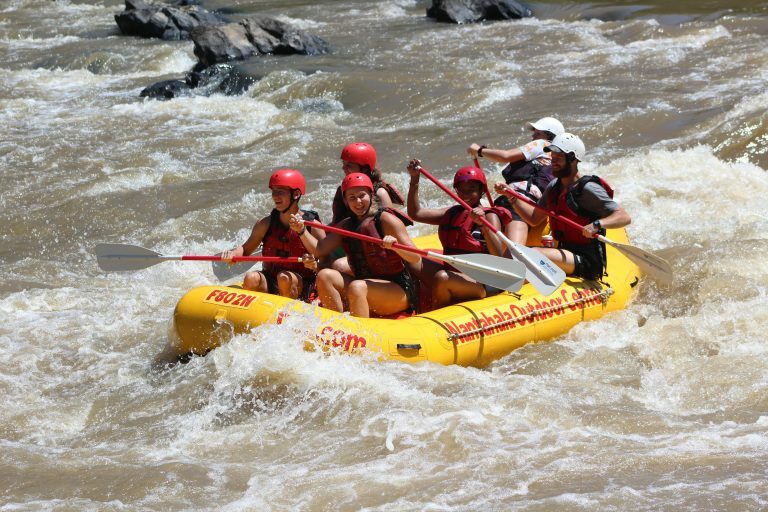 Possible adventures for each session could be: flat and whitewater canoeing, rock climbing, mountain biking, backpacking, and earth skills. Most activities that leave camp will take place in Pisgah National Forest, Nantahala National Forest or DuPont State Forest. Pisgah and Nantahala National Forest activities are authorized by US Forest Service special permits. The shorter 10 day Mountainside experience is a great way to be introduced to what Mountainside has to offer on a smaller scale. The same core philosophy of the 3 week sessions holds true in our shorter program: learning successful group living, respect for the environment and the outdoors, and developing new outdoor skills. Adventures The possible adventures for the 10 day sessions are similar to those offered during the 3 week sessions. Campers will spend a half day trying out each of the five adventures on “mini adventures”. Next they choose the adventure in which they want to participate and spend one day training in this particular activity. They will then be ready for their overnight adventure which consists of two days and two nights out of camp in Pisgah National Forest or Dupont State Forest. Climbing on a climbing wall and real rock face on belay. Open-boat canoeing on nearby rivers. Crafts, Farm, Sports, Camping Skills & Nature, High Ropes Course, & other camp activities based on interests of the campers. A co-ed program for campers finishing 8th & 9th grade. Riverside is a good opportunity for young people who have finished eighth and ninth grades to continue their Gwynn Valley experiences. The community living, physical challenges, responsibility, and peer interactions provided in Mountainside continue in development and are expanded upon in Riverside. A large portion of the time on Riverside will be spent on three separate four-day wilderness adventures off of camp property. Each trip will focus on one of the following skills: rock climbing, white water canoeing, and backpacking. As a Riversider, campers will not only be involved in participating in the trips, but will also be active in the many aspects of getting ready for multi-day excursions. Our days at camp will be spent preparing for the adventures, building skills for each outdoor component, participating in a service project, and building a strong Riverside community. Availability and Living Arrangements Riverside campers live in “Indian Paintbrush” and “Joe Pye” along with one counselor for each cabin. The Head Counselor and Logistics Coordinator will also help with cabin responsibilities. These cabins are close to the “Center”, which will act as the community meeting space and shower house. 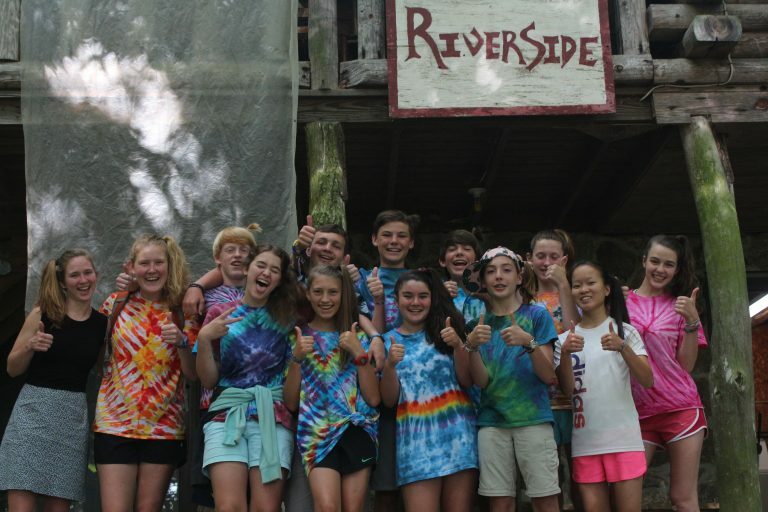 Campers take an active role in maintaining a cooperative spirit by assisting with maintaining our Riverside community. When they are on camp, they will eat in our dining room with the rest of camp. Riverside is not for everyone. Young people with a keen interest in the outdoors, a strong desire to develop skills in adventure recreation activities, and a concern for building a positive, responsible community will get the most out of their experience on Riverside. Most activities that leave camp will take place in Pisgah National Forest, Nantahala National Forest or DuPont State Forest. Pisgah and Nantahala National Forest activities are authorized by US Forest Service special permits. A co-ed program for campers finishing 9th and 10th grades. The Young Leaders Program is part of Gwynn Valley’s Older Program progression and is specifically designed for campers finishing 9th and 10th grades. This program focuses on leadership development and acts as a bridge between camper and staff roles at Gwynn Valley. Leadership skills developed in this program will serve campers in many aspects of young adulthood and beyond. These are the key components of the Young Leaders Program. Much like on Riverside, the Young Leaders live together in single-gender cabins under the direct supervision of a staff member. In both the boy’s cabin and the girl’s cabin, there is a staff member living in the cabin as a designated YL cabin counselor and additional support staff such as program leaders who live in the physical space to provide support and coverage where needed. As in all program areas at camp, there is also a Head Counselor who oversees the Young Leaders program. Community Building: As in all programs at Gwynn Valley, we place a strong emphasis on community building with peers. 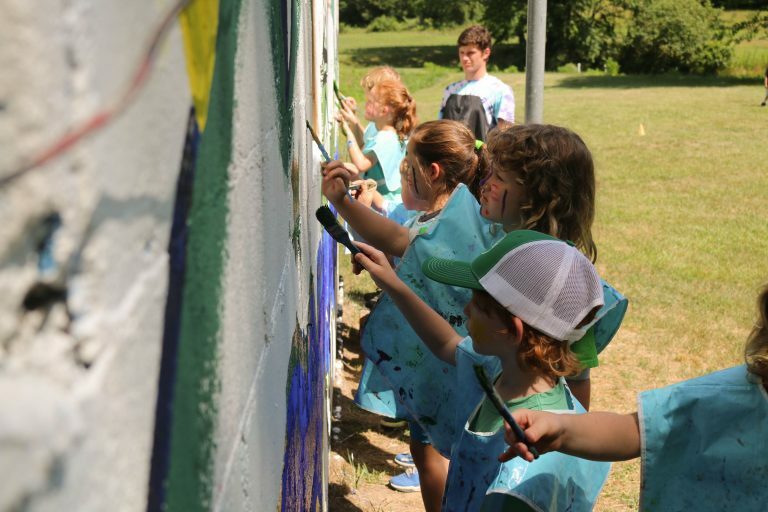 Young Leaders are still campers and will have the opportunity to participate in uniquely designed evening programs, art projects, trips, activities, socializing and more. Young Leaders participate as a group in some Main Camp activities as interest, time and resources allow. In 2017, Young Leaders were able to participate at the farm, stables, crafts, mill, waterfront, and more. 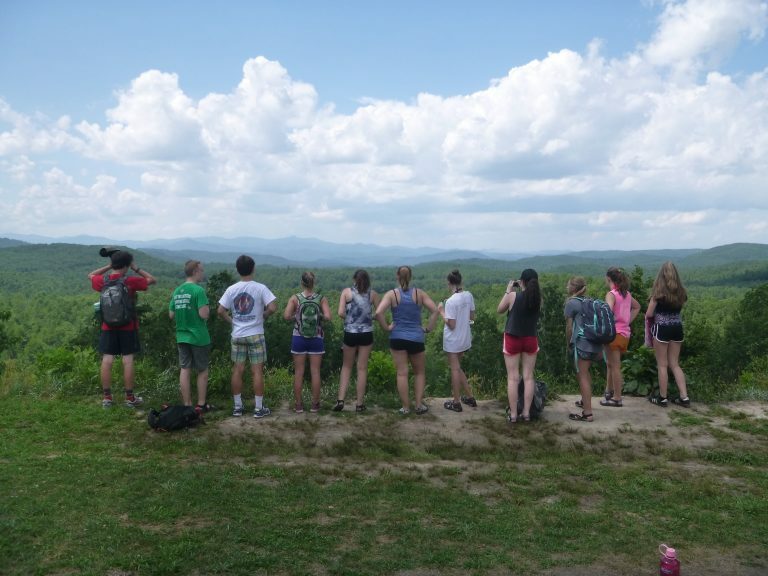 Leadership Seminars: The exact list of seminars is always evolving based on the interests and specialties of both staff and campers at Gwynn Valley in a given summer. 2017 Leadership Seminar topics included exploring personal leadership styles, servant leadership, public speaking, gender and leadership, outdoor adventure and leadership, event planning, the FISH! philosophies, child development, conflict mediation, and among others. First Aid & CPR Certification: Young Leaders participate in a full day of training and receive a certification in basic First Aid & CPR through the Red Cross. This certification is valid for 2 years. Apprenticing with Main Camp Program Leaders: Young Leaders have the opportunity to participate in Main Camp activities as an apprentice by assisting with instruction during Morning Discoveries. Young Leaders are assigned to discoveries based on their interests and skills as well as the needs of camp. Outdoor Adventure: This aspect of Gwynn Valley is very much part of the YL Program, though it is emphasized less strongly than in Mountainside and Riverside. On camp, Young Leaders participate in hiking, swimming, the Ropes Course, and camping out as all Gwynn Valley campers do. 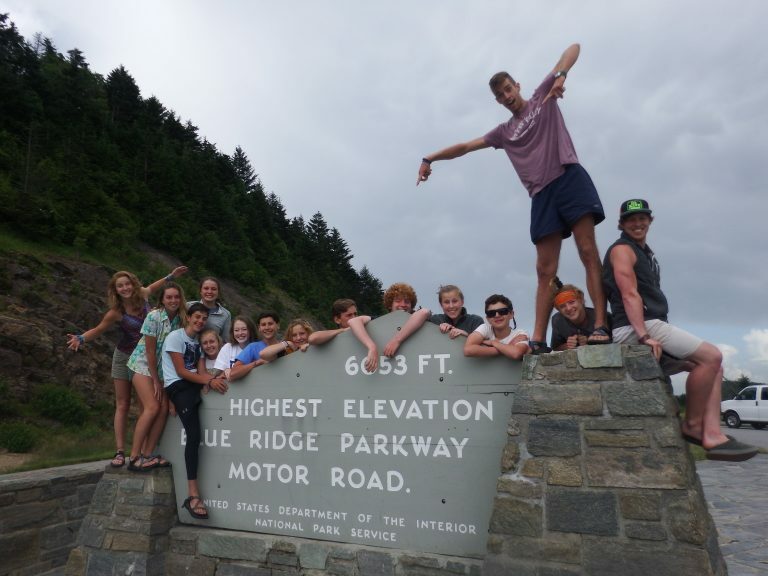 Young Leaders also leave camp for a taste of outdoor adventure (day trips only) such as white water rafting, hiking and swimming in nearby National and State forests. Additional day trips in rock climbing or mountain biking could be added depending on the interests of the group. Community Service and Chores: Young Leaders help the Gwynn Valley community by setting tables before each meal and helping out with big camp events such as Special Day and Tajar Ball. Young Leaders also engage in a few community service trips off camp such as volunteering at the Transylvania County Boys & Girls Club and donating surplus GV Farm produce to local food pantries and soup kitchens. The Young Leaders Program was founded in 2016 and continues to evolve each summer. If you have any questions about the program, please contact Kevin McDonald via email (kevin@gwynnvalley.com) or phone (828-885-2900). For boys and girls who have completed Kindergarten through 4th Grades. Gwynn Valley’s Day Camp is based on the tradition of our residential program which has specialized in working with younger children since 1935. 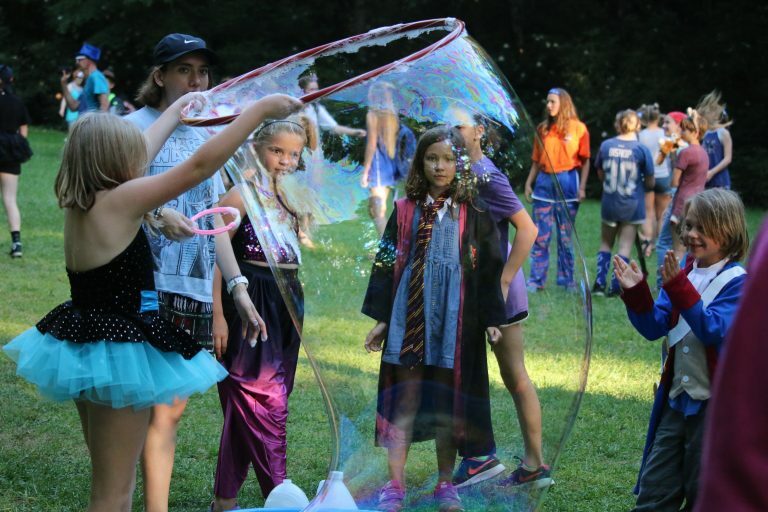 With a non-competitive philosophy and co-ed population, there is an atmosphere of nurturing that maximizes the chances for a successful camp experience for both resident and day campers. Print a copy of our Day Camp Brochure. It is our goal to create a fun, learning atmosphere where children can form a relationship with the natural world as well as lasting friendships with each other. 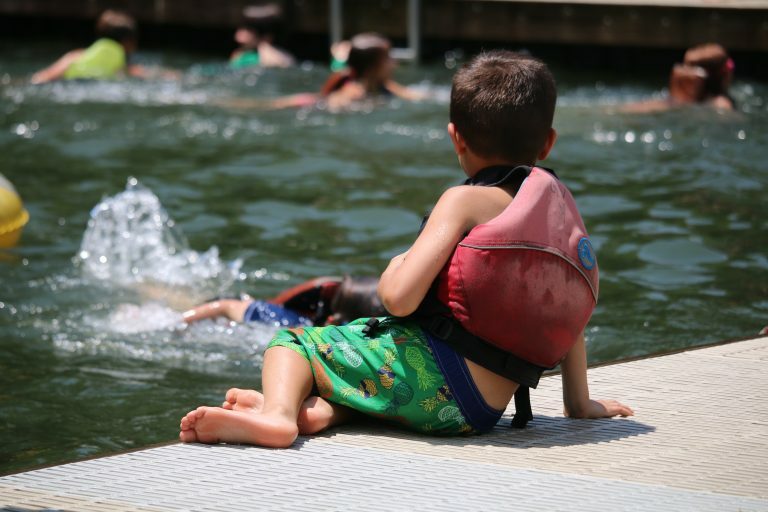 During each camp day the children participate in a variety of activities ranging from nature exploration, crafts, drama, and music to swimming, sports, and group games. The children are divided into small groups for the Morning Activities and will visit a different program area each morning. In the afternoon, the children have the opportunity to make their own activity choices. At our working farm, campers learn first-hand about fresh vegetables, food production, and animal care. 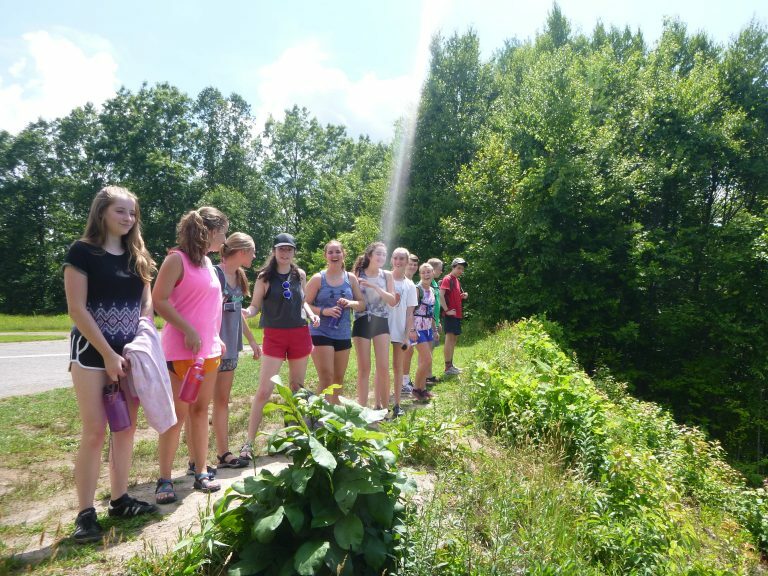 Campers have the opportunity to visit the farm, ride horseback, do archery, learn nature and camping skills, swim and play at the lake front, and participate in the mill program once during the week. Our staff come from different parts of the world and are hired for their experience, creativity, and caring nature. Our camper to staff ratio in Day Camp is 5:1 plus there is a Day Camp Director and Logistics person. Because of the nature of Day Camp we spend most of our day outside and carry our “cabin” with us. This means that we need to be prepared for all weather. We get rain many afternoons and will continue the program as long as the weather allows. Bringing a rain jacket every day is essential. 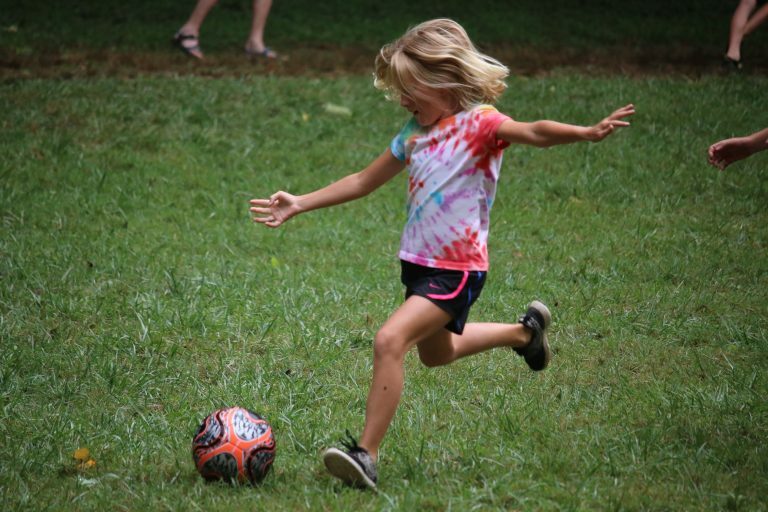 Campers enrolled in Day Camp and their families are invited to meet the staff and tour the grounds at 4:30 PM on the Sunday before their session begins. This is a good opportunity for new campers to become familiar with camp before their session begins. It is also a good time to organize a carpool with other parents. All sessions run from Monday through Friday. Drop off is at 8:30am and pick-up is at 5:15pm except on Friday when we finish at 4:00. Enrollment for each child is limited to no more than 3 weeks, and no more than 2 sessions may be consecutive. For session dates, prices, and availability updates, see the Dates & Rates tab below. Early registration is recommended to ensure session availability. The balance is due by May 1. Tuition is refundable any time before May 1 except for the deposit. No refund will be made for late entrance or early withdrawal, except when caused by serious illness; in this case, the loss will be shared equally by the parent and the camp. A non-refundable deposit will be applied to tuition. If your income is below $40,000 you may request a Scholarship/Discount form from our office. Gwynn Valley offers a limited amount of financial assistance for Day Camp. This is based on the income of the home where the camper resides. To request a Scholarship Application, please email shelley@gwynnvalley.com. For a printed copy of this packing list, download a copy of the Day Camp Brochure found at the top of this program section in bright orange.